This week's first quarter moon is the perfect target for your new telescope. If you received a new telescope over the holidays, you're probably eager to put it to use. 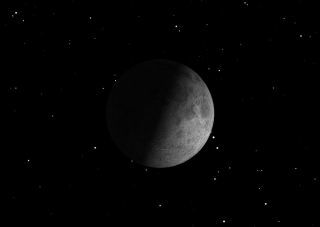 This week's first quarter moon is the perfect place to start. For beginners, the moon is the brightest object in the sky other than the sun, so is an easy stargazing catch. Many people who buy telescopes are lost when trying to find targets in the sky. They've read so much and seen so many pictures, but haven't any idea how to actually find things in the sky. But some readers may ask: Why target the first quarter moon? There are actually two reasons. The first quarter moon is perfectly placed in the early evening sky. A week earlier and it was too close to the sun. A week later, and you would need to stay up late to see it. That's because the moon orbits the Earth, causing it to rise about 50 minutes later each night. First quarter is the "just right" point in its orbit for convenient viewing. If you are new to telescopes, take some time to assemble yours carefully, and practice using it in daylight. It probably came with more than one eyepiece. Choose the one with the longest focal length, probably 20 or 25 mm. If your telescope is a refractor or a Cassegrain, you probably will need to insert a diagonal between the eyepiece and the telescope, a small L-shaped optical device. If your telescope came with a Barlow lens, set that aside for now. Take off the lens cap, all of it. This may sound dumb, but many small telescopes come with a two-part lens cap, like a doughnut and its hole. Many beginners make the mistake of removing the hole but not the doughnut, and don't understand why everything looks so dark. You will probably need to align the small finder scope with the main telescope. Point the telescope at something at least a quarter mile away: a chimney or a telephone pole. Then adjust the small screws on the finder so that the same object is centered in the finder. It's important to adjust the finder to the telescope, not the other way around. It will be colder outside than you expect, even in a warm climate, so dress warmly. Be sure you have a comfortable seat. You will see a lot more in you are seated comfortably at the eyepiece. This may not be as easy as it sounds, especially if your telescope is on an equatorial mount rather than the Dobsonian mount we often recommend for beginners. No sooner than you find the moon, it will speedily move out of view. The moon itself is moving slowly around the Earth, but most of this movement is caused by the rotation of the Earth. Some telescopes are equipped with motors and slow motion controls to help track the moon. You will need to master these before you can comfortably track the moon in the telescope eyepiece. Be aware of what direction the sun is shining from. Directions through the eyepiece are confusing at first, because your telescope's optical system will flip the image in unexpected ways. Astronomers soon get used to this, but it can be very confusing at first. The mountains and plains on the moon will seem very familiar from similar topography on Earth. The most surprising features for most beginners are the moon's many craters. There are similar craters on Earth, scars from meteor falls in the distant past, but most are covered up by vegetation and erosion. On the moon, these scars are laid bare, as fresh as the day they formed, often millions or billions of years ago. Some craters have flat floors, where lava has flowed to a level surface. Others have terraced walls, the mighty impacts which formed them still revealed in the rays of the rising sun. You may want to experiment with more magnification, using a different eyepiece, but stick with a low-power view for now. Changing eyepieces usually results in needing to center the moon again and refocus. This may prove frustrating until you become more comfortable with the telescope's controls. It's amazing how much you can see, even at low magnification, because the moon is so close. Even your lowest magnification is probably more magnification than Galileo had with his first telescope. Take some time to watch what happens as the sun rises over the moon's surface. Because the sun is very low close to the terminator, the shadows can change strikingly in only a few minutes of viewing.